India is a land of diversity. India has got the largest history and many cultures have evolved here from last hundreds of years. Lately, the Indian government has made it easier on the outset, to get Indian E-Tourist Visa for Chinese citizens. Over 62,000 had visited India in 2016 alone. Since the introduction of E-Tourist visa, the whole process has become a lot easier than it was earlier and the number of visa applications has increased exponentially. We ourselves had helped to process over 17,000 India tourist visas in 2017 alone. Though the introduction of E-Visa was aimed at making the visa application process a lot easier for the foreigners visiting India, it was very poorly implemented. The website crashes very often and almost everyone encounters a lot of problem with the payment portal too. In reality, using the online visa issuing portal is not as easy as it sounds to be. This guide will show you how you can get your Indian E-Tourist visa as a UK citizen by following our simple instructions below. Can Chinese citizens get India tourist visa or business visa on arrival at the airport? Effective November 27, 2015, the visa on arrival scheme was replaced by online ETVs (Electronic Travel visas) like most of the other countries. So you need to avail your electronic visa before you arrive in India. The visa approval process takes time, which is why applications cannot be made on the day of travel. In fact, airlines will make sure you are holding India E-visa before you board your flight to India. So if you turn up at any Indian airport without a visa, you will be asked to go back in your next flight home. How long does it take to get E-Tourist visa for Chinese Citizens? It could take anywhere between two to four days to get your visa approved. The visa will not be issued to you right after you submit the application form. Once you complete all the application and submit it, someone from the Indian government will check all the documents you have submitted. If the officer checking your visa application form is not happy with the documents you have submitted, you may be asked to submit some other additional documents too. It is advised to keep checking your inbox often. The Indian government website says that India E-Tourist visa must be applied at least 4 days before your travel. To avoid the last minute confusions we suggest at least 10 days. Double entry is possible on E-Tourist Visa and E-Business Visa. while triple entry is possible on E-Medical Visa. The visas are non-extendable and non-convertible. How many days is the Indian E-Tourist visa valid for? The Visa validity is 60 days from the day of arrival in India. When you arrive at the airport, your passport will be stamped and an expiry date for your e-visa will be handwritten by an Immigration Officer. The visas are non-extendable and non-convertible. If you want a visa with multiple entries, then you can get a sticker visa which may be valid for 10 years. For 10 year visas, you need to fix an appointment with the Indian embassy and submit the application in person. How much does it cost for India E-Tourist visa for Chinese citizens? India E-Tourist visa fee for Chinese citizens is 320￥ (50$). This does not include the 2.5% service fee which the credit card processing company charges. If you would like us to process your tourist visa, we charge a processing fee of $25 on the aforementioned amount. 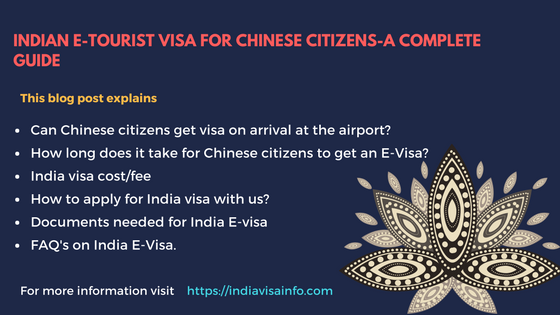 What are the requirements for India E-Tourist visa for Chinese passport holders? Is it easy for Chinese citizens to apply for India E-Visa? The Indian Visa issuing portal is one of the unreliable websites you can ever find. Chances of the website crashing when you are about to complete the application are very high. The banks are not capable of accepting any kind of online payment without hassle. The only reliable mode is someone physically going to the bank to make a payment against your visa application. Most of our customers come to us after facing all these problems to ease their visa application process. The major challenge in applying for India E-Visa is that you get only 3 attempts to get your payment right. Failure to make a successful payment within 3 attempts will result in blocking of your application ID. If you need someone who can handle the entire visa application process for you, right from completing your visa application to making sure that someone physically goes and make a payment to the bank on your application’s behalf. All you will need to do is fill the below form and we can help you get your Indian visa within 2 days with minimum hassle to you. Do I get a discount if I only want your assistance in making payment against my visa application and not complete the full application? Sure, we give you a 50% discount on our service fee. So if you need our assistance only to complete payment for your existing application, then we charge only $25. How many times can I apply for E-Tourist visa in a year as a Chinese citizen? Foreign nationals can avail E-Visa twice in a calendar year (from 1 January to 31 December). Beyond that, they will have to get a sticker with 10 years validity. You need to print at least one copy and have it on you at all times, during your entire stay in India. You will need a printed copy of your E-Visa and passport for immigration clearance. Once your documents have been verified, you have to provide your fingerprints and photo (biometric information). Then an immigration officer will place a visa sticker in your passport. Once our agents collect all the information we need from you, we will apply for India visa on your behalf. So you may need to give us 2 working days at most to procure your E-VISA.